Stand-up chairs offer the perfect solution for tired feet in busy, active work spaces like restaurants, kitchens and pharmacies. Our stand-up chairs are easily-adjustable ergonomic stools that encourage good posture and movement, while helping active workers take the weight off their feet whenever they need to. Many of our designs are portable and compact so they can be easily stored and bought out for spontaneous breaks and meetings. What is a stand-up chair? 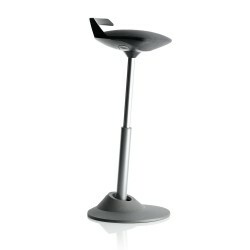 A stand-up chair is an ergonomic, height-adjustable stool that makes it easier to alternate between sitting and standing throughout the day. Why are stand-up chairs needed? 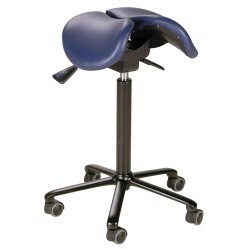 Employers are required to provide suitable seating for all employees under health and safety law. While we know it’s not healthy to sit down for long periods of time (over six hours of sitting a day raises the risk of conditions like diabetes, heart disease and obesity according to some studies), there are also health risks associated with standing for long periods of time. Around half of UK workers spend most of their working days on their feet – with professionals such as receptionists, assembly line workers and retail staff often having to stand in one place for hours at a time. Prolonged standing can put pressure on the lower limbs, increasing the risk of aching muscles, limb swelling, varicose veins and even coronary heart disease. What are the benefits of using a stand-up chair? Stand-up chairs encourage workers to move between sitting and standing throughout the day. Stand-up chairs are height-adjustable so they can be used by different height workers at a range of surfaces, from desks to high work tops and counters. Ergonomic – All of our stand-up chairs are designed to improve back posture by supporting the natural S-curve of the spine. Portable – stand-up desks are lightweight and take up less space for easy portability and storage. Slide under counters when not needed. 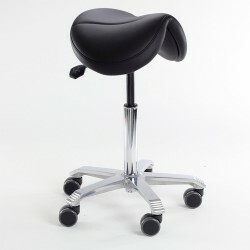 Order your stand up chair online!